Blog For Freedom: Hillary Joke Even a Liberal Can Laugh At! Hillary Joke Even a Liberal Can Laugh At! Here's an email that's so funny, I had to post it! "NOW THIS ONE IS FUNNY ~ I DON'T CARE WHAT PARTY YOU ARE! 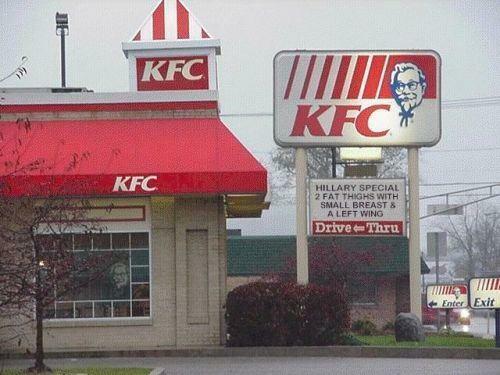 ACTUAL KFC SIGN IN NEW YORK..."
This is a great tip especially to those new to the blogosphere. Simple but very accurate info… Appreciate your sharing this one. A must read article! Read the Arizona Law Before You Criticize It! Obama Man Can - he sprinkles it with Hope and makes the world feel good! Finally... a Cure for Too Much Barack Obama! Barack Obama is for Hope & Change Alright! HINESViola18 on Who's on First - the new version!